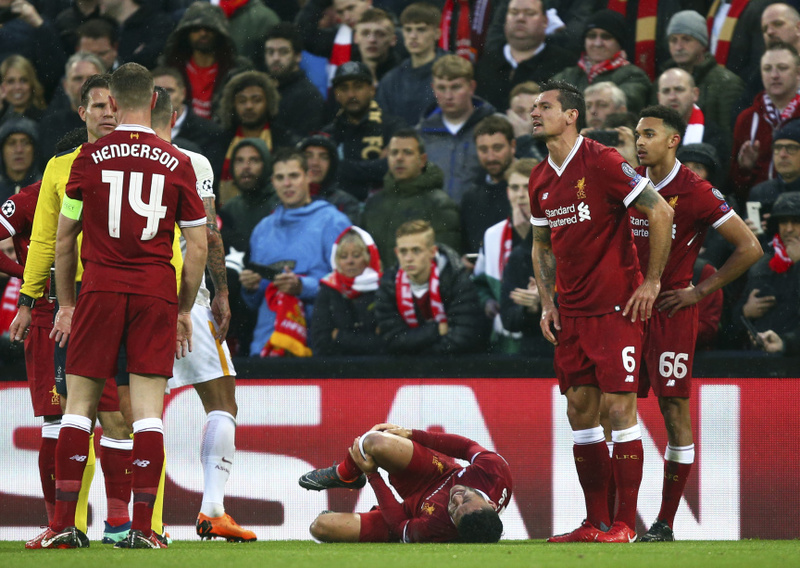 LIVERPOOL, England (AP) — England midfielder Alex Oxlade-Chamberlain was ruled out the World Cup on Wednesday after sustaining knee-ligament damage playing for Liverpool in the Champions League semifinals against Roma. Oxlade-Chamberlain was carried off on a stretcher in the 18th minute of the first leg at Anfield on Tuesday. The 24-year-old midfielder was assessed by Liverpool, which said he will not return to full fitness until next season. Not only will he potentially miss the Champions League final — Liverpool beat Roma 5-2 on Tuesday — but he is also out of the World Cup in Russia, two years after being ruled out of the European Championship with a knee injury. He also suffered a knee injury shortly before the 2014 World Cup in Brazil, when he was still included in England's squad but didn't play in any of the team's three matches. "No specific timescale is being placed upon his return to action at this stage," Liverpool said in a statement. Oxlade-Chamberlain has become an established member of England coach Gareth Southgate's squad after settling well at Liverpool following his move from Arsenal at the end of last year's summer transfer window. He was on course to start in England's opening match of the World Cup, against Tunisia on June 18. Liverpool's midfield resources are stretched heading into the final games of the season, with Emre Can and Adam Lallana also currently out injured. "The squad doesn't get bigger at the moment," Klopp said after the game against Roma, "so we need to be creative in the next few games."